A few months ago, I was pairing with the world-renowned command-line-tool expert Chris Toomey. As is my wont, I tried to learn a trick or two from his workflow to add to my repertoire. And that pairing session did not disappoint. So I did what any normal person would do and went dumpster diving through his dotfiles. 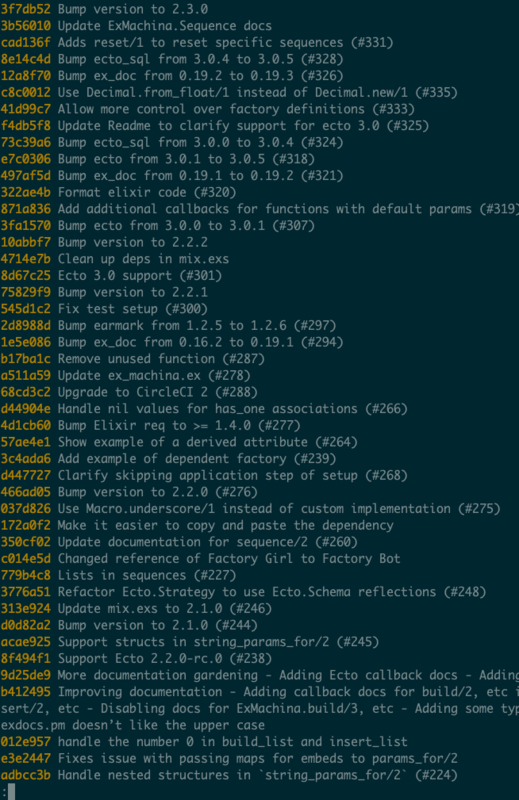 Let’s ignore the aliases for now (we’ll revisit them later), and let’s focus on decoding the options being passed to git log. The --oneline option is one of the most useful (in my opinion). 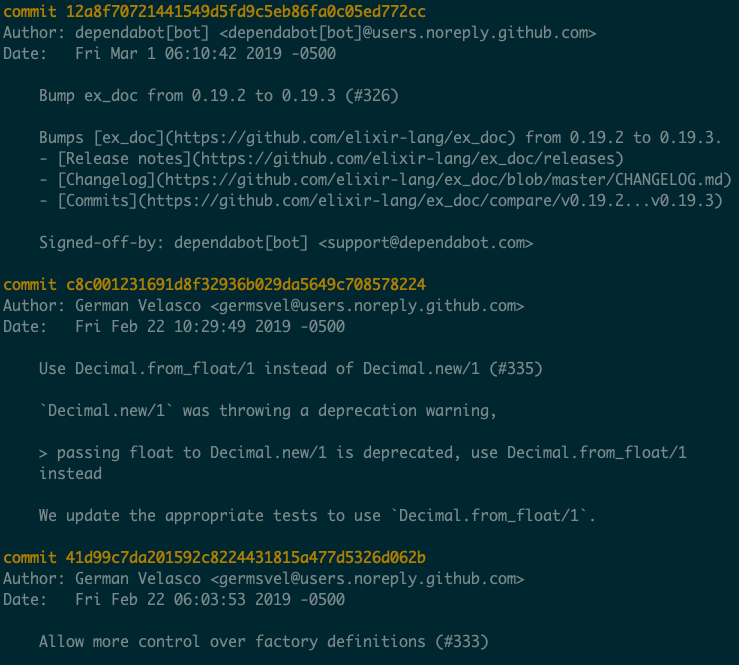 It allows us to see the commits in a more streamlined way, especially when we are not interested in the full commit messages. As we can see, the --decorate option gives us some really helpful context for tags and branch names (technically they are ref/heads, ref/remotes, ref/tags, etc. which you can see with --decorate=full). Without them, I would not have known that my master branch is at the same place as origin/master. It’s also very helpful for me to see tags like v2.2.2 because it allows me to know when we released that version of ExMachina! Okay, let’s examine that last option, the -20 part. 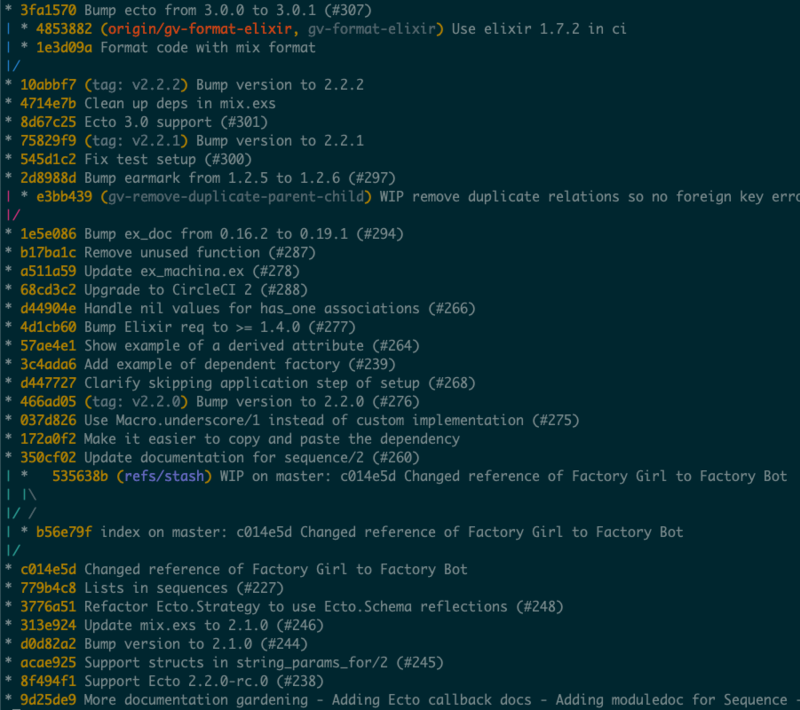 Let’s run git log --oneline --decorate -20. If you guessed the -20 only shows you the most recent 20 commits, then you were right! 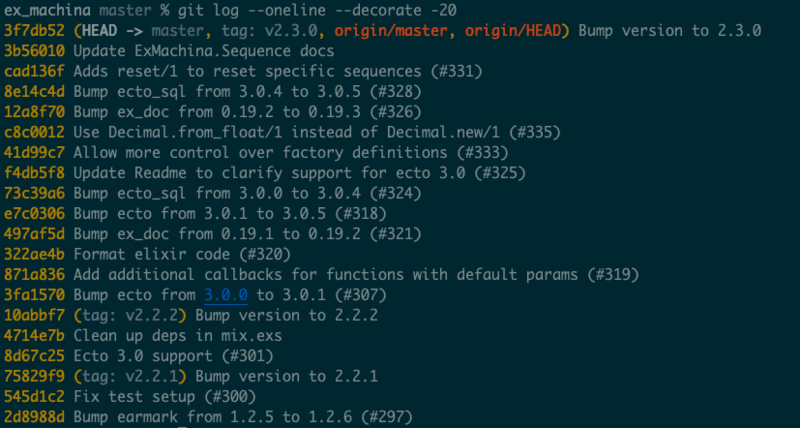 Over the last few months, git log --oneline --decorate -20 has become my de-facto way of looking at git log. Let’s now look at some of the other options we’ve seen with the alias sla, namely --graph and --all. Draw a text-based graphical representation of the commit history on the left hand side of the output. But what happens when we combine it with --all? 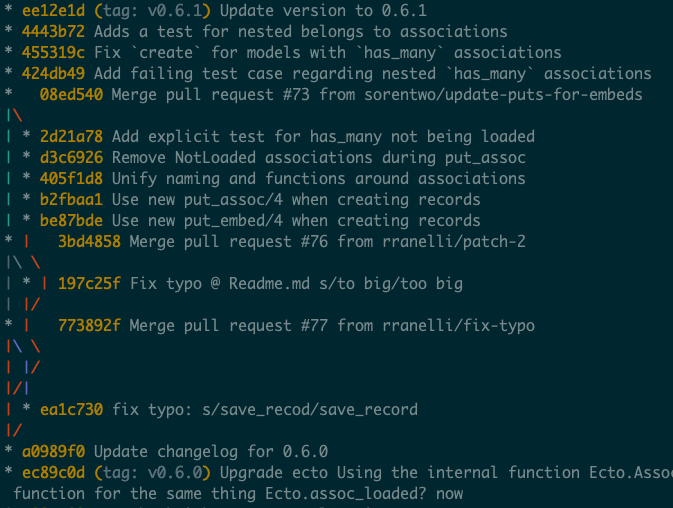 Running git log --oneline --decorate --graph --all brings on all the goods! By adding the --all option we can see all other branches and how they relate to master. This is what I had seen Chris use that had blown my mind. As you might guess, adding the -20 option at the end will limit the number of commits to 20, and I’d usually recommend using that option (otherwise you might get a lot of output). git sl: I think of “git single line”. 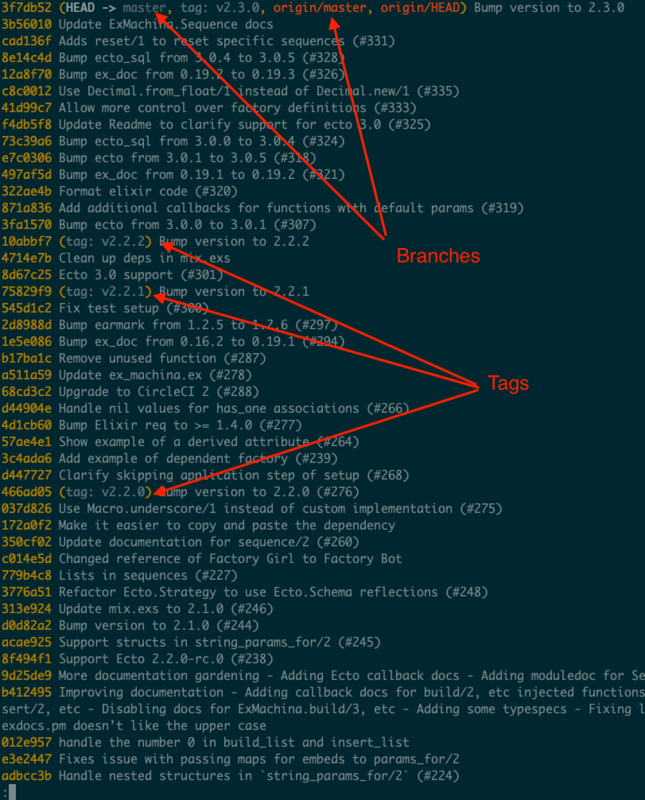 git slap: When you have a lot of branches in a project, the volume of information that comes from this command is like a slap in the face. So I only use this alias for cases when I want to get “git slapped”. I trust that after seeing my “git slapped” mnemonic device, you will prefer my memorization techniques to whatever Chris may have had in mind. But in case you didn’t, I leave as an exercise for you to ask him in twitter. Even if you didn’t like any of the logging options I presented here, I still encourage you to do some dumpster diving on your own. The thoughtbot dotfiles repo is a great place to start. There are pearls to be found.